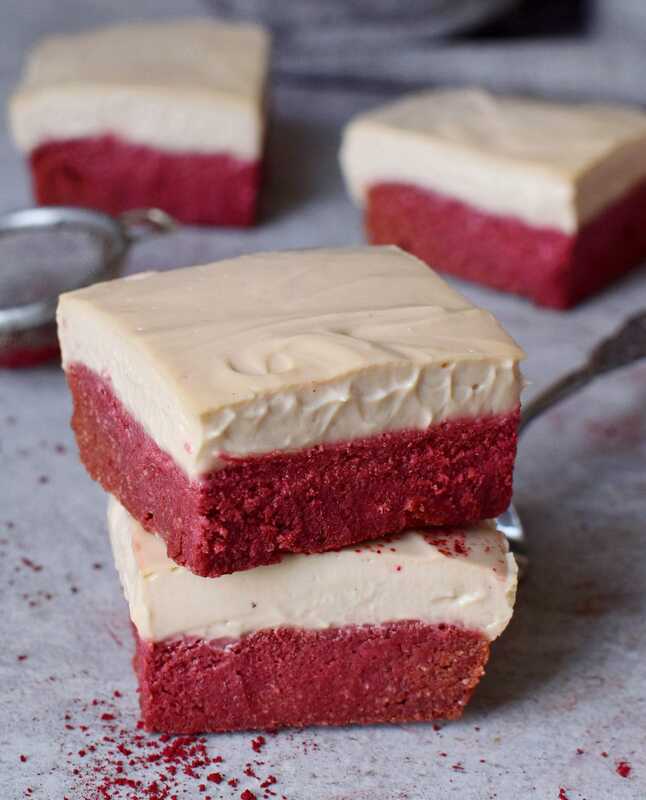 Rich and creamy red velvet bars made with natural beet powder (NO food coloring)! The recipe is vegan, gluten-free, oil-free, high in antioxidants and easy to make. This blog post is kindly sponsored by SUNFOOD, all thoughts and opinions are my own. This is hands down the best cake I ever made! I am not kidding. I made many amazing desserts like cakes, brownies, cheesecakes, pancakes, crepes, bars etc but this one is so special. It’s rich, moist, soft, creamy, lush, and super delicious! The recipe is vegan, gluten-free, oil-free, and easy to make. 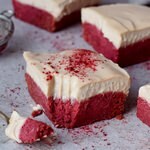 You can make red velvet bars as I did or use a round cake tin to make a beautiful red velvet cake. 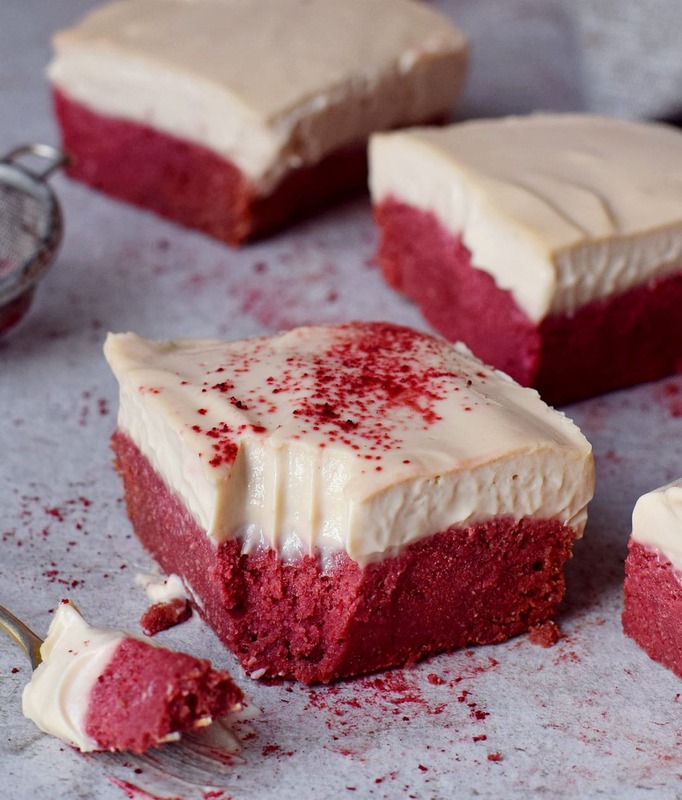 I didn’t use any artificial food coloring which you can find in most red velvet recipes. Instead, I used 100% natural beet powder which is so much healthier than a red food dye. 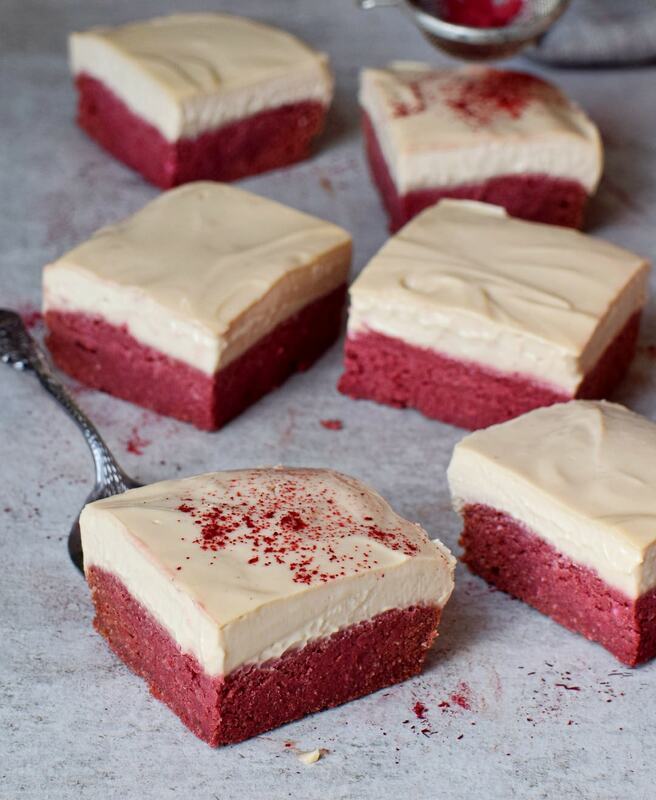 These healthy red velvet bars contain only wholesome ingredients like oats, shredded unsweetened coconut, plant-based milk, raw cacao powder, beet powder, cashews etc. There is no need to use dairy, eggs, butter, cream cheese or food coloring. Even though this recipe is vegan, oil-free, and gluten-free, it still turned out exceptionally good. As mentioned before, I never made a cake before which is so rich and moist and I am sure I will make this dessert more often in the future. Even my boyfriend loves it and he is not a big fan of desserts! 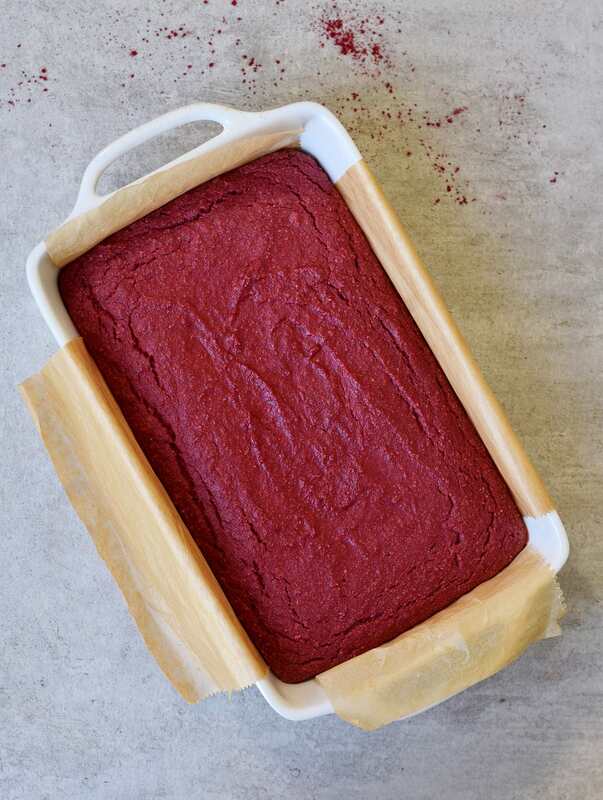 I wanted to make this cake as natural as possible, that’s why I used Sunfood’s beet powder. This amazing powder is organic, vegan, gluten-free, Non-GMO, Kosher and has an incredible red color which is 100% natural. No artificial food dye, no chemicals, just dried beetroots in powder form. Beets are known as a nitrate-rich superfood. Nitrates may support healthy blood flow, increase energy, and stamina. Their Beet Powder also has betaine, which may help liver function, cellular reproduction, and aid in the creation of carnitine — which helps your body turn fat into energy. (2) Craig S. Betaine in human nutrition1’2. Am J Clin Nutr. 2004;80(3):539-549. I don’t know what I love more about this recipe, the beautiful red bottom or the rich luscious cream. The cream contains no oil at all and the main ingredient is cashews. You will need to soak the cashews for best results but if you put them in hot water it takes only about 45 minutes. I haven’t tried a nut-free version in this recipe yet but the thick part of a can (or better two) of coconut milk could work as well. You need to put the can in the fridge overnight and then use only the thick cream, not the water. The result will be different though since cashews add more creaminess, in my opinion. You can easily prepare the cream in a blender which works best for this recipe. If you don’t have a blender, a food processor might work too. I used oats for this recipe which I processed in a coffee grinder to make oat flour. You can use regular oats or gluten-free oats and process them in a blender. You can also use store-bought oat flour. To make the recipe grain-free you could possibly use buckwheat flour instead of oat flour. I didn’t try it out in this recipe but it should work fine. If you aren’t gluten-free you can most likely use all-purpose flour (wheat flour) or spelt flour. 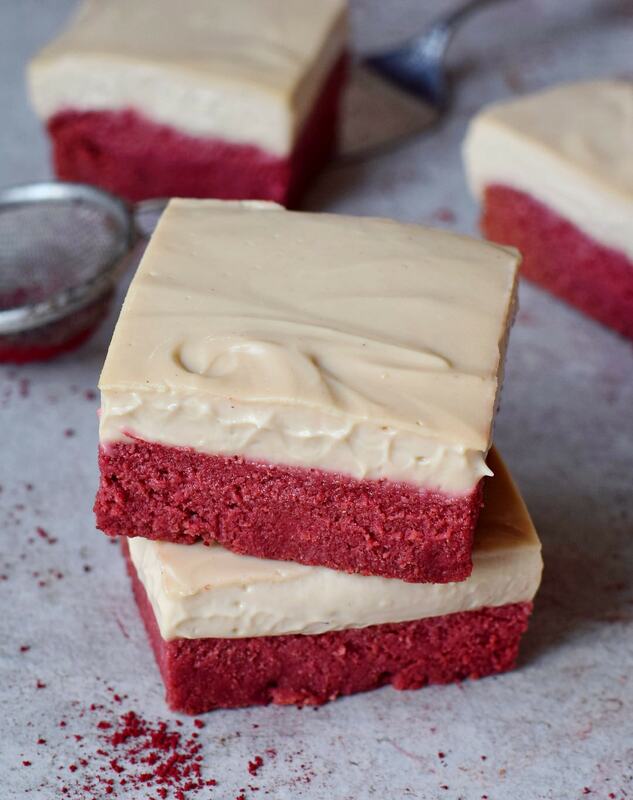 Should you recreate these red velvet bars, please leave a comment below and don’t forget to tag me in your Instagram or Facebook post with @elavegan and #elavegan because I love to see your recreations. 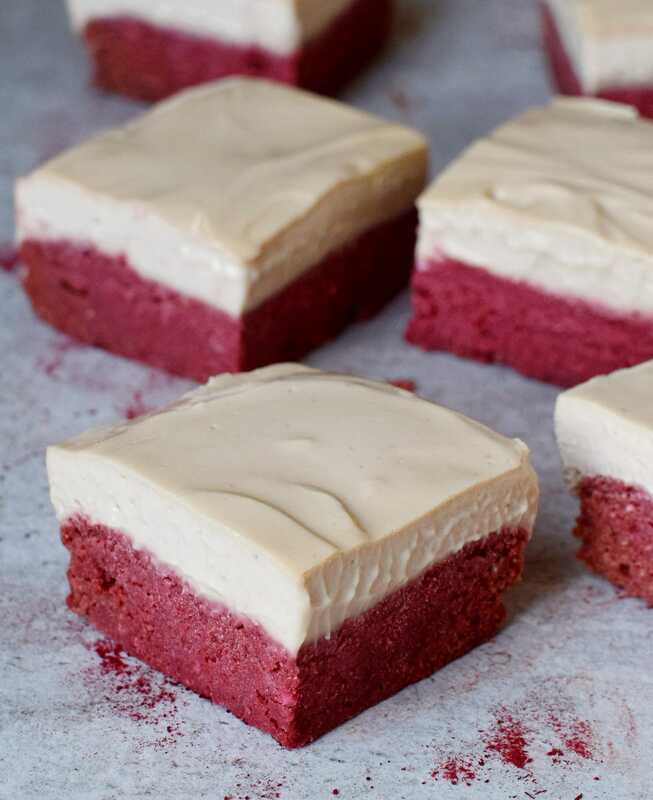 These Red Velvet Bars are vegan, gluten-free, oil-free, and super easy to make. They are rich, soft, moist, creamy, and delicious. Perfect for dessert, breakfast or a birthday party! 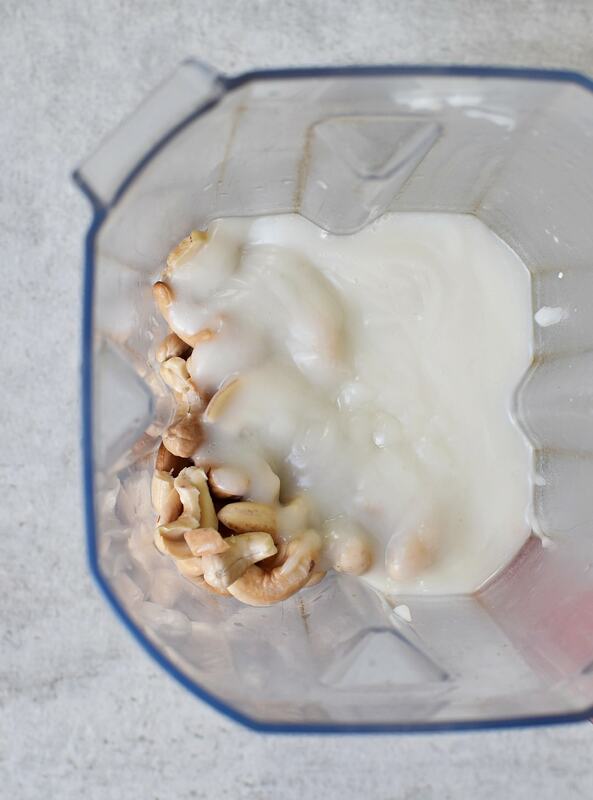 Soak cashews in hot water for about 45 minutes. Meanwhile, start making the cake. Preheat oven to 360 degrees F (180 degrees C) and line a baking dish with parchment paper. My baking dish measures 9"x6" (23 x 15 cm). Process the shredded unsweetened coconut in an electric coffee/spice grinder or blender. Then put all dry ingredients into a bowl and stir with a whisk. Pour the wet ingredients into the bowl of the dry ingredients and stir with a whisk until combined. Spoon the batter into the baking dish and bake in the oven for about 22-25 minutes and let cool. To make the cream, add milk, cornstarch, sugar, and vanilla extract into a small saucepan and bring to a boil while stirring. Once the pudding boils turn off the heat. Set aside. 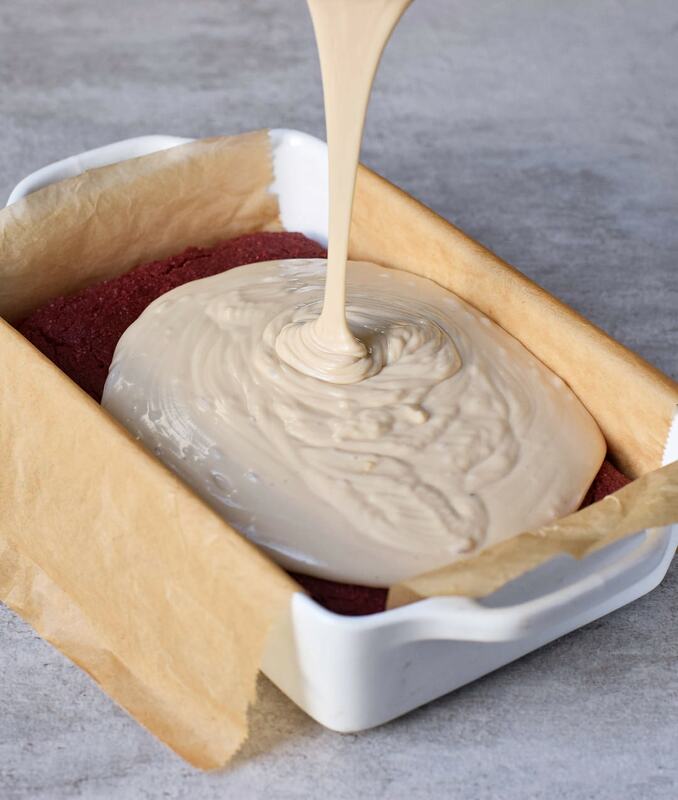 Put the cashews into a blender (preferably a high-speed blender), add the pudding, and mix until the cream is completely smooth (might take a minute or two) and pour it onto the cooled cake. Put the baking dish into the freezer for about 3 hours to set (or until the cream is not soft anymore). Cut into bars and enjoy! Store leftovers in the fridge. *Granulated sweetener: You can use regular sugar, Erythritol, Xylitol (birch sugar). coconut sugar etc. **You can use 75 g ground almonds (almond flour) or any other ground nuts of choice. ***You could use applesauce instead of banana. An even better idea would be to use beet puree, which will also add a nice color! ****You can use tapioca flour/starch or arrowroot flour/starch instead of cornstarch. I absolutely love the look of these Bars! The color is so amazing and the cream on top looks so delicious! ???? …The thick part of a can (or better two) of coconut milk could work as well. You need to put the can in the fridge overnight and then use only the thick cream, not the water. The result will be different though since cashews add more creaminess, in my opinion. What a lovely looking bar! I have beets so can I use it instead of powder ? If yes can you give measurements please? Can I Just used any beet powder please? Any milk should work in this recipe! 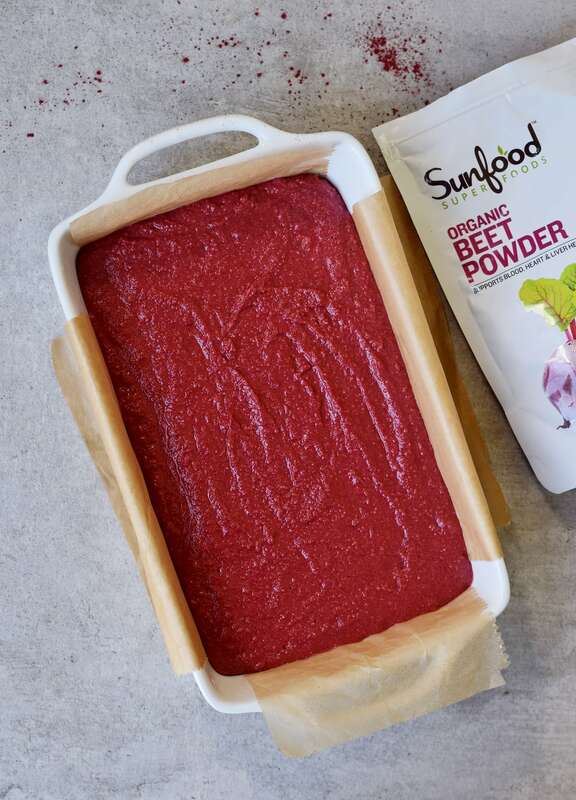 I have the sunfood beet powder too it’s amazing. Lovely bars Ela! Do they taste like beets? Let’s start at the top and work our way down… the cashew pudding/cream is amazing!! I could seriously even just dip berries in it, no cake required. Buttt, the cake is the finishing touch! 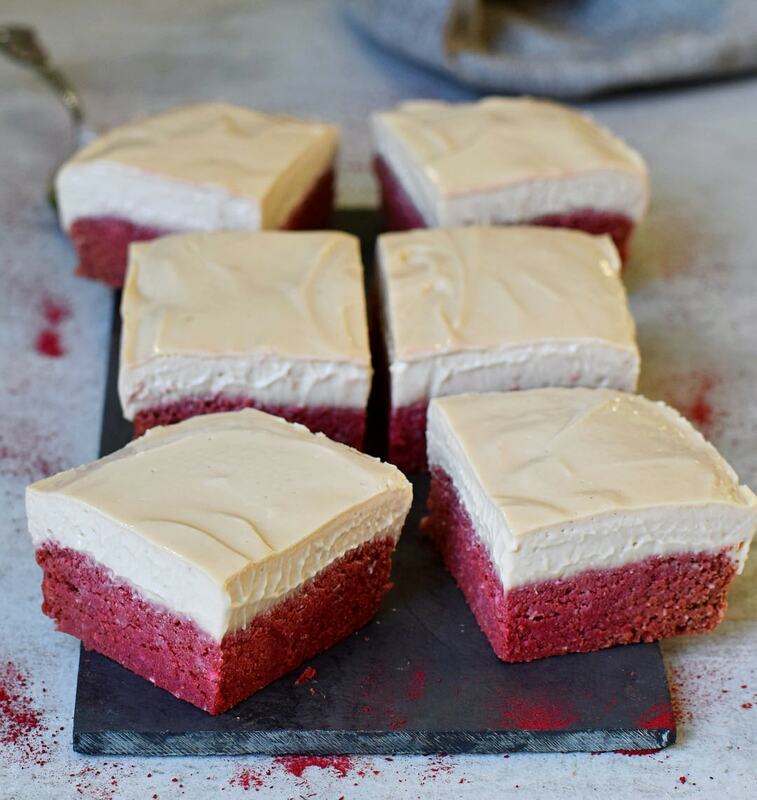 I used natural beet-based liquid food coloring rather than powder so mine aren’t quite as red (if I add too much of the liquid, you can actually start to taste the beets), but rather than the appearance, these are a yummy 5 stars! Hi! In your notes… what is the almond flour in place of? I made these yesterday and they are absolutely out of this world! The texture couldn’t be any better and the flavor??? ?… I used applesauce (which I tend to do when baking) instead of bananas and cashew milk for my nut milk! I had never cooked/baked with beet powder before. I’m actually not big on beets and think they taste a little to earthy for me. 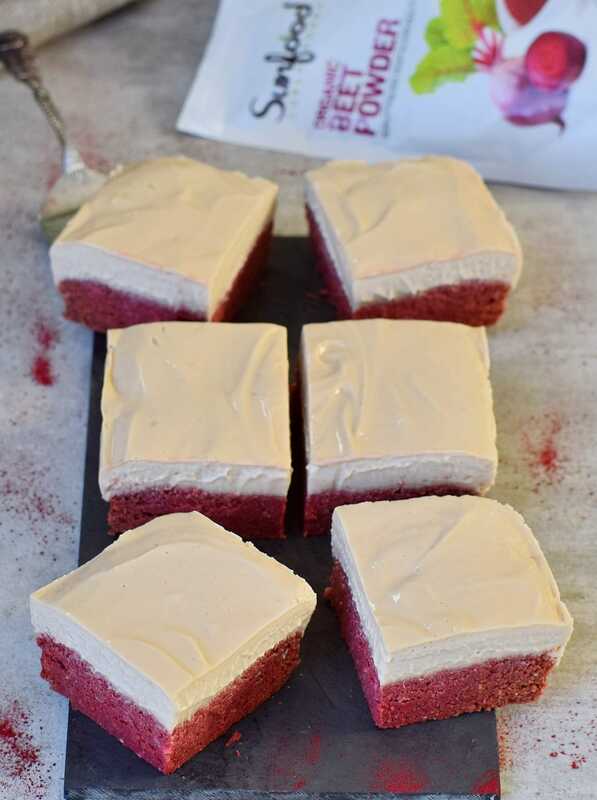 HOWEVER…you can’t taste the beet flavor AT all, it just gives them that radiant valentine red:) All my NON-vegan friends and coworkers had them and were in heaven, they are willing to pay me if I bake them for them (not kidding). These are 10/10!! Hallo Susi! Das ist echt komisch. Bei mir war der Kuchen überhaupt nicht gummiartig. Wie du hier bei den Kommentaren lesen kannst, hat auch sonst niemand diese Erfahrung gemacht. Hast du denn alle Zutaten wie im Rezept angegeben verwendet (Kokosflocken usw)? Wie lange hast du den Kuchen gebacken? Next time I will do these in the food processor doe a more cakey texture, but they did not disappoint. Wow! Yet another phenomenal recipe from this website. These bars have been a huge hit at my house and while I have no changes to mention, I will say that if you’re striving for a white pudding for the top layer, then organic coconut sugar is not what I’d pick as a sweetener as the end product is tan rather than white. We don’t worry about the looks at my house. These bars are absolutely incredible and well worth making. Forgot to mention that I chose puréed cooked beets in place of banana/applesauce. Beautiful red hue and you’d never know beets were involved. I also used Oat Milk. Fantastic recipe !! Thanks for the lovely recipe! I would like to try it, but I’m wondering if I can use a liquid sweetener for the pudding such as agave or maple syrup and should I put less milk in that case? These look amazing! What would you suggest for the granulated sweetener of choice in order to keep the top a creamy white shade? Sorry, I know there’s an * but I can’t seem to locate it???? Hi Ela, these look amazing! I am wondering if I can replace the shredded coconut with shredded carrots? Or any ideas for substitute? I’m thinking of making for a friend who is allergic to coconut. Hi these look amazing! Are you able to tell me what the calorie intake is for one serve?